Archivists Round Table of Metropolitan New York - A.R.T. 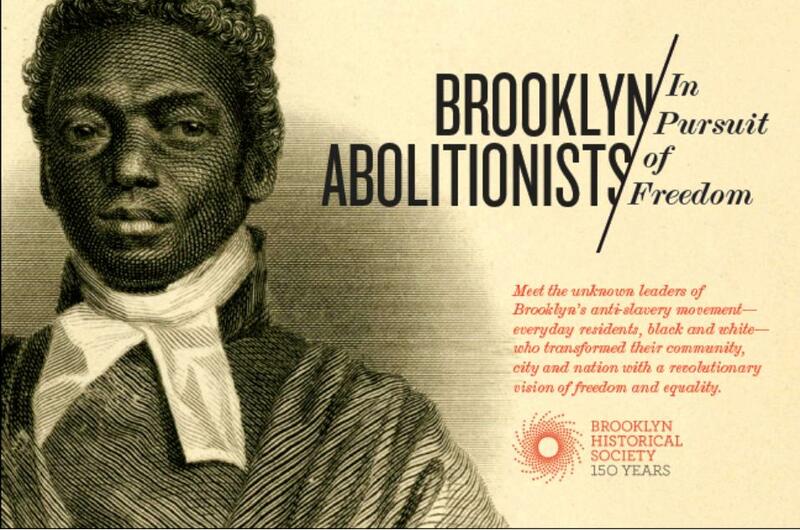 March 2014 Programming Event: The Making of "Brooklyn Abolitionists/In Pursuit of Freedom"
A.R.T. March 2014 Programming Event: The Making of "Brooklyn Abolitionists/In Pursuit of Freedom"
For all BHS staff members. Use registration code "BHS". Please present authorized staff I.D. at the registration desk in order to be granted free admission. Please join us for a special talk on the creation of the major exhibition Brooklyn Abolitionists/In Pursuit of Freedom at the Brooklyn Historical Society (BHS), a presentation of archival photographs, census records, newspapers, maps, and more exploring Brooklyn's anti-slavery movement. This major, long-term exhibit explores the unsung heroes of Brooklyn’s anti-slavery movement - ordinary residents, black and white - who shaped their neighborhoods, city and nation with a revolutionary vision of freedom and equality. The exhibit is part of the groundbreaking In Pursuit of Freedom public history project that features new research on Brooklyn's abolition movement in partnership with Weeksville Heritage Center and Irondale Ensemble Project. To learn more about the exhibition and partner project, please visit the In Pursuit of Freedom website. This program will feature a talk and presentation by key project staff for Brooklyn Abolitionists/In Pursuit of Freedom, including Historian and Curator Prithi Kanakamedala and Archivist Larry Weimer, on the process of putting together this landmark exhibition, as well as how the allied yet differing priorities at play in the archivist-historian relationship were negotiated throughout this fruitful collaboration. Following the talk, event attendees will have the opportunity to peruse this much-lauded exhibition, along with the beautiful results of BHS's recent renovations! A.R.T. would like to thank the Brooklyn Historical Society, particularly the BHS Library and Archives, for graciously co-sponsoring this program. Online Registration Required. Please register no later than midnight on Wednesday, March 26th. Please note that you MUST pay in advance online in order to attend this program. (You DO NOT need to have or create a PayPal account to pay online). If you have any questions or concerns regarding payment, please email programming@nycarchivists.org.